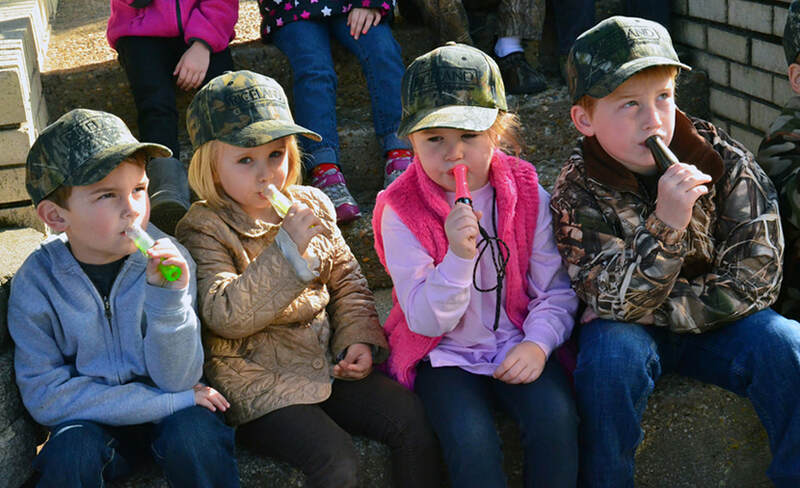 For Young children can learn the basics of duck calling by attending the Riceland Children’s Duck Calling Classes held each year at the Wings Over the Prairie Festival. Classes begin at 10:00 a.m. Friday, November 23, 2018, in front of the Main Stage. The classes are open to children between the ages of 4 and 8 years old. Children must bring their own duck call. For over 40 years, the Children’s Duck Calling Classes were conducted by former World Champion Duck Caller Pat Peacock, and her sisters Dixie Holt and Brenda Cahill. The three women are the daughters of legendary duck call maker Chick Major, who was famous for the Dixie Mallard Duck Call. In 2016, they decided that would be their final year and it was time to pass the reigns. In 2017, classes began being conducted by former Women’s World Champion Duck Callers Patti Thompson, Malu Hammans, Lee Tackett, and Shelby Free. The classes are held as a way to get young children interested in duck calling. For many, it’s their first introduction to the sport.